The works to improve Bond End are now complete. You can read more in our news article here. 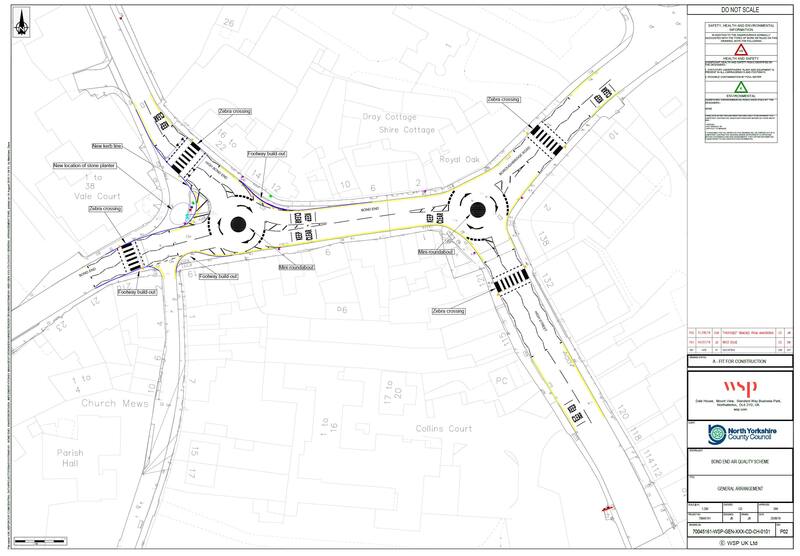 The improvements involve replacing seven sets of traffic lights with two mini-roundabouts. The scheme started on Monday 10 September. Regular updates on progress can be read below. You can also view a larger image of the plans (jpg / 423 KB), or the original drawings (pdf / 2 MB). You can read updates from each week of the works below. These show the progress of the project and address any concerns raised during the works. 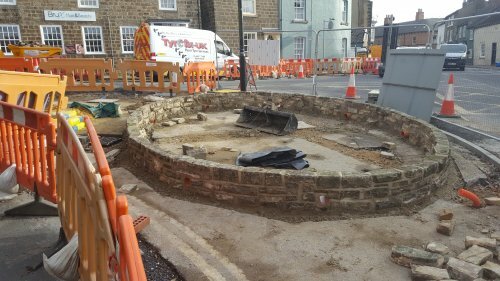 This is the final update as works are now complete. Tactile crossing to be installed close to no 132. Ducting outside no 138 to be laid. Final bits of paving to be laid. NPG on site to make the connections for lighting columns. Lighting and signs Posts to be completed. Private utility connections (WSP and PBS to monitor progress). Resurfacing around the planter area. 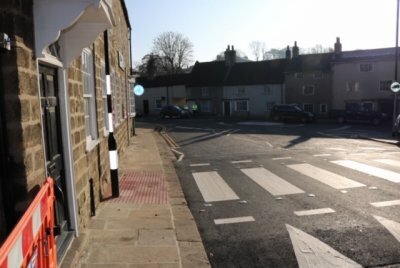 Belisha Beacons to be installed for the zebra crossings. Private utility works on High Bond End 6-8 November under day time road closure. Resurfacing to Bond End A59 (6/11/18). Resurfacing to Bond End A6055 (07/11/18). 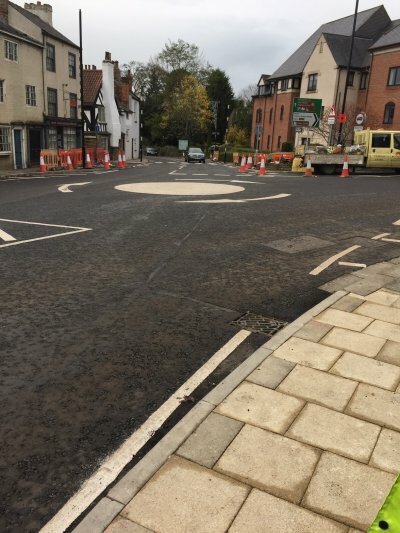 Resurfacing to High Bond End (8/11/18 and 09/11/18). Paving and ducting works as part of phase 4. BT to install new covers. 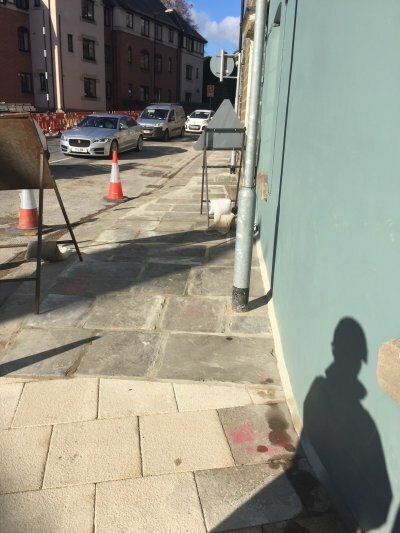 Kerbs and tactile paving to be laid as part of phase 4. Planing, resurfacing and lining works will take place from 30 October 2018 through to 9 November 2018. 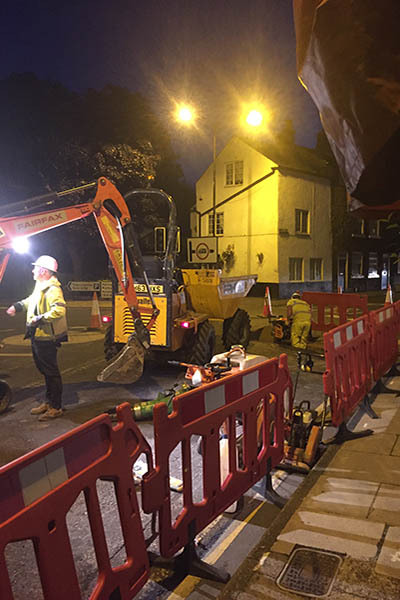 The works will require night working between the hours of 6.30pm and 2.30am. A road closure will be in place during these hours except when the resurfacing takes place when the road closure will be between 6.30pm and 5.00am to allow the new surface to cure. 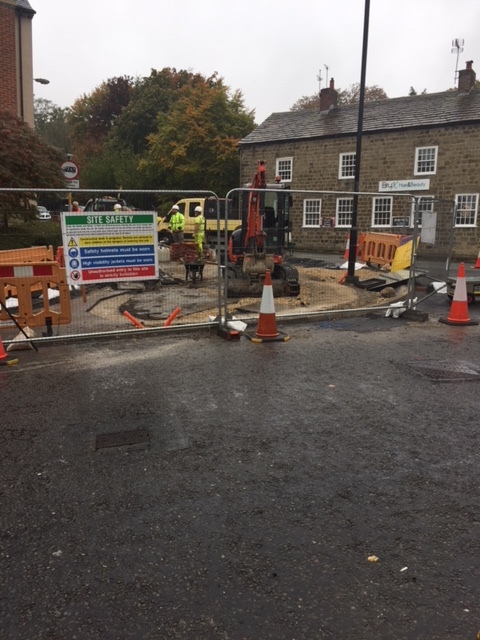 In addition to this, Northern Powergrid and Northern Gas will be carrying out private utility works to a property on High Bond End which will require a complete road closure between 6 November 6 and 9 November, although we are hopeful the works can be carried out in two rather than three days. 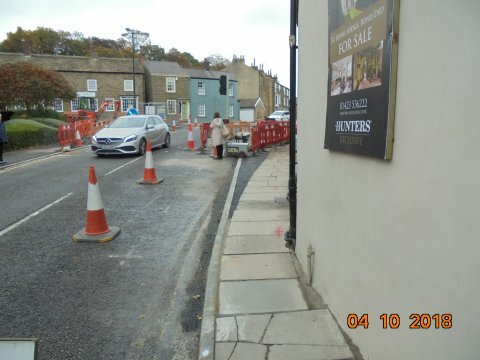 The council were only made aware of these works in early October. 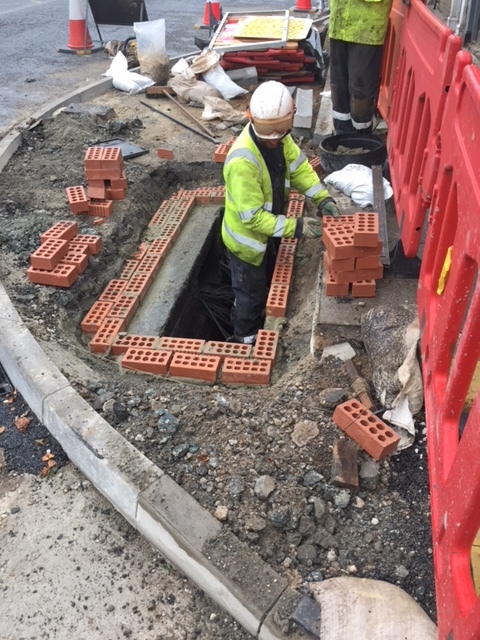 However, it is essential that our contractor accommodates the utility companies during their programme to ensure reinstatement works take place before the final resurfacing of the junction. Laying of all the York Stone flags (Phase 3) completed. Planter filled with top soil. 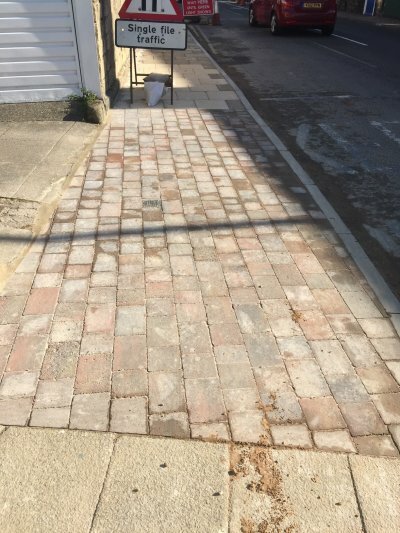 Completion of the tactile paving (phase 3). Traffic management switch over in preparation for the phase 4 works. 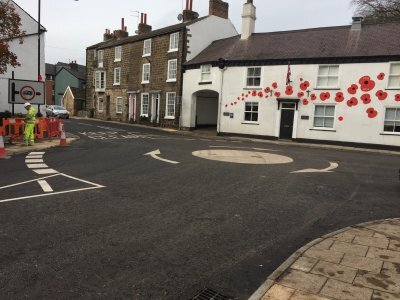 Including a temporary mini roundabout on Bond End/High Bond End junction (near the new planter). 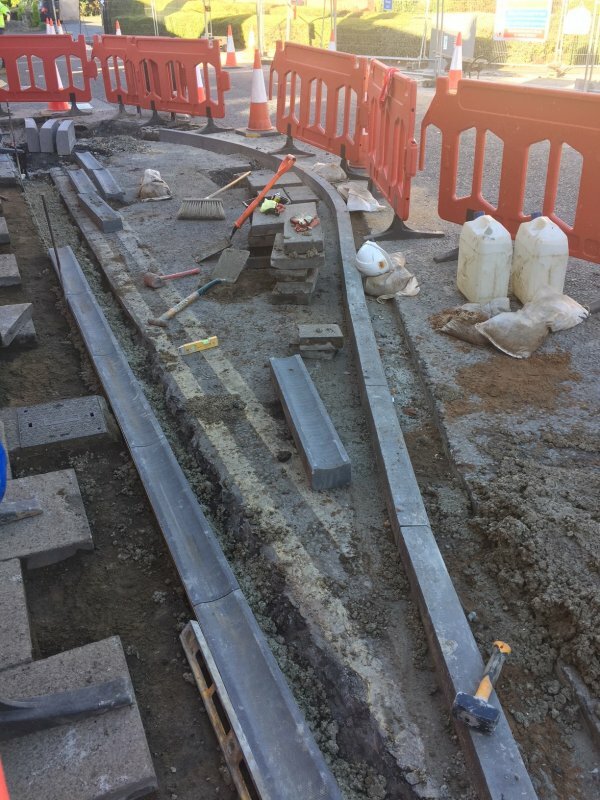 Excavation of kerb line for the installation of the new speed table. Removal of stone channels close to the Hair Salon. Build-up of the catch-pit outside No 12. 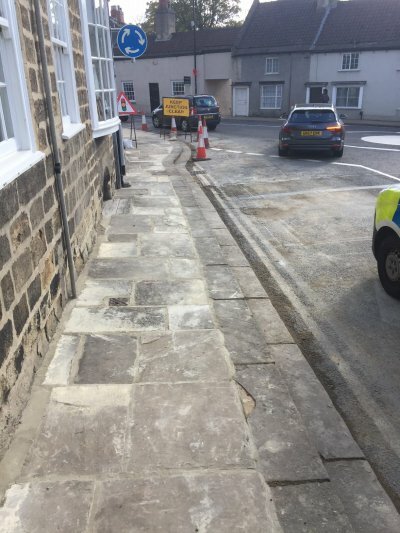 6m of Kerbs at the West of No 12 complete. 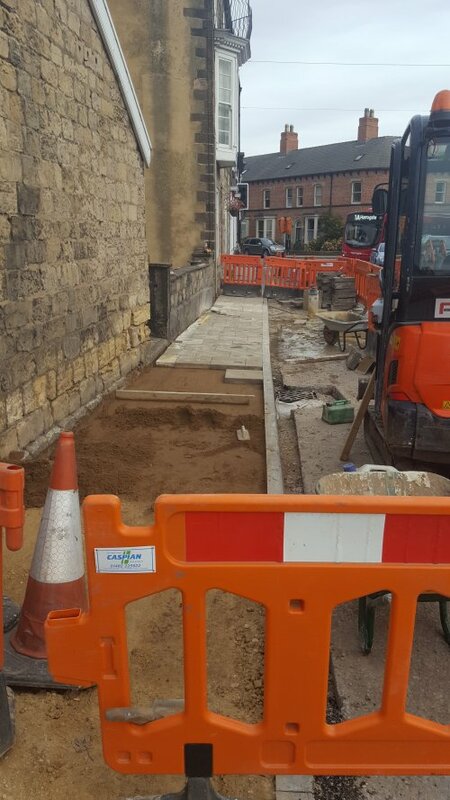 Type 1 stone and sand screening laid ready for flags to be laid at the West side of No 12. Red tactile paving laid outside of No 21a. Signposts installed in the planter area. 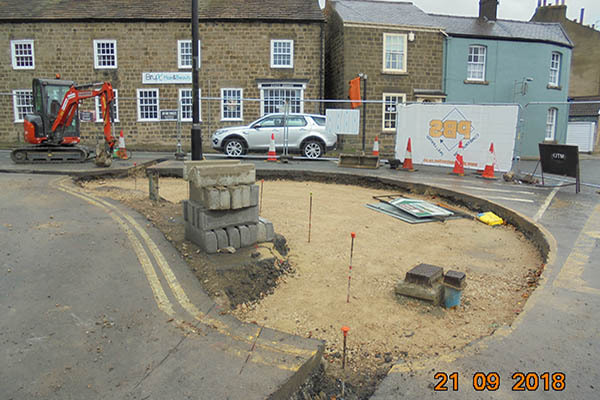 Work ongoing on the corner of Church Lane ready for the installation of a Belisha beacon crossing point. New gully connection installed outside the hairdressers. Works on the BT channels. Phase 3 build out works between numbers 6-22 Bond End. Preparation for laying of new kerbs at build out area. Lighting column sleeves to be installed at various locations around the site. Stone works to the planter to be undertaken. 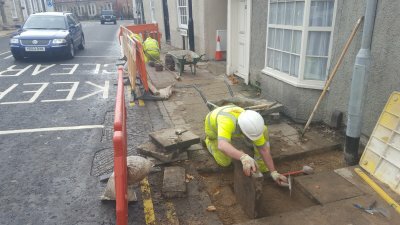 BT works to complete works on site. Temporary mini roundabout signs to install on site. • Footings for new planter (time permitting and if no issues with installing new gullies). New gully position by cycle shop excavated. 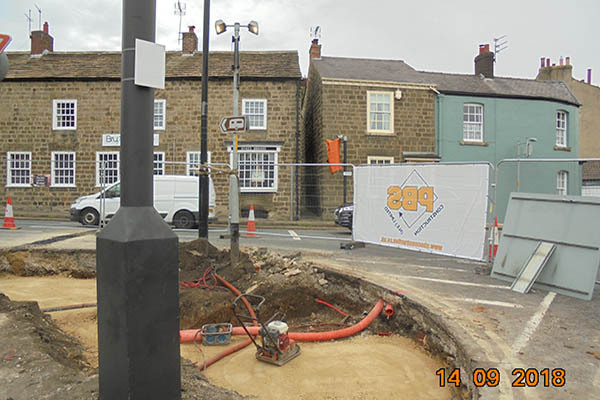 The contractor continues to monitor traffic management throughout the day with the aim of fine tuning where required to reduce localised congestion where possible. Temporary removal of some of the larger temporary traffic signs due to high winds. 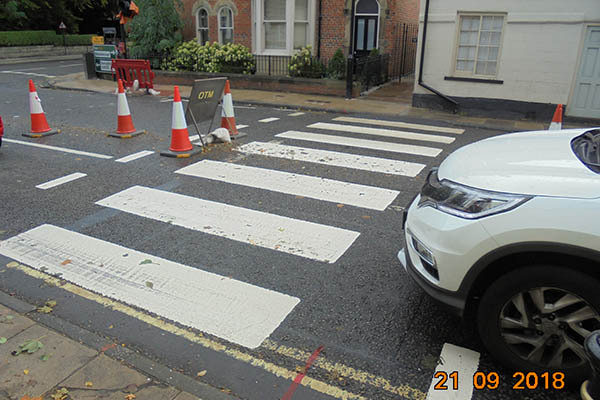 Installation of two pedestrian crossings on Friday 14 September, following requests from the public at the Best Western Hotel and High Street. Traffic signals will no longer be able to be manually controlled due to the pedestrian crossings and therefore an increase in congestion is likely. 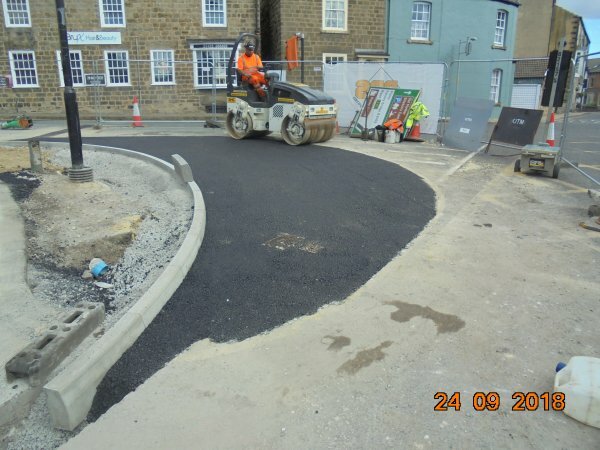 The work is part of a programme of schemes funded from the National Productivity Investment Fund, a £5.1million sum we have secured to improve local roads and public transport. The junction was identified as an Air Quality Management Area in Harrogate Borough Council’s Air Quality Action Plan submitted to the Department of Environment, Food and Rural Affairs in 2013. It was an area where the annual target for nitrogen dioxide, which mostly comes from traffic pollution, had been exceeded. One of the main actions required a review of the existing junction at Bond End and the implementation of highway improvements to address the issue of queuing traffic. Results from a constructive public consultation in January were considered by the Bond End Steering Group, which represents the county, borough and town councils. It was agreed that additional traffic data was to be collected. Over the summer, our consultants have been working on sophisticated traffic modelling to determine which junction layout would bring the most benefits in terms of air quality and safety. Road surveys were carried out in May 2018.